The Library should have at least one copy of all deposited Illinois dissertations prior to 2010. More recent dissertations are deposited in IDEALS, University of Illinois' institutional repository. Non-circulating archival copies (prior to 2010) are kept in the Rare Book and Manuscript library, with a circulating copy located in other libraries. To begin searching for dissertations, use the Advanced Search in our online catalog and search by author, title, subject, and department. 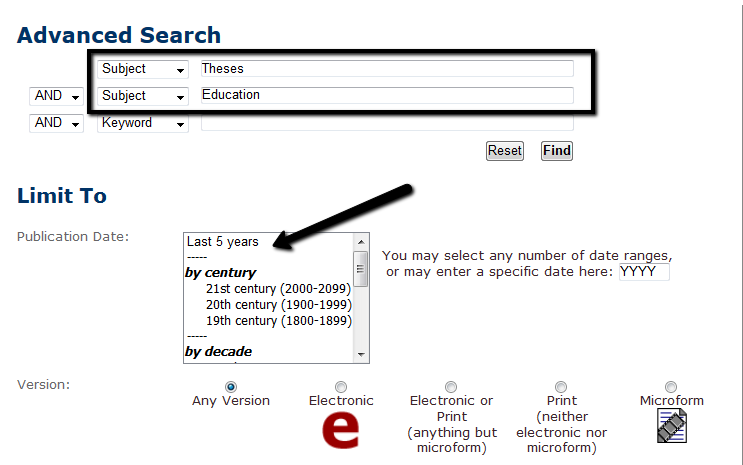 Change your search to a "Subject" search and type in "Theses"
Add another "Subject" term for the area of study you are looking in, for example "Education"
IDEALS is the Illinois Digital Environment for Access to Learning and Scholarship and is the University's open repository of scholarly content. From Fall 2010 on, all graduate students depositing a dissertation or thesis to the Graduate College are required to do so electronically. After approval and degrees are conferred, the dissertations and theses are made available in IDEALS. Withdrawal policy: Dissertations and theses may not be withdrawn except in extremely exceptional circumstances governed by the Graduate College. Updating documents: Authors and faculty advisers may not update or change the dissertation or thesis once it has been deposited in IDEALS except in extremely exceptional circumstances governed by the Graduate College. Access Restrictions: Authors and faculty advisers may not directly request an access restriction through IDEALS. These requests must be made by the author to the Graduate College. Metadata Updates: Small corrections to metadata such as corrections to spelling errors may be made through a request in IDEALS. Per communication with the Graduate College, metadata is not considered part of the academic record. However, substantial changes should still be avoided if unnecessary. Metadata records can also be updated to include links to related items, such as a corresponding dataset in the Illinois Data Bank. To contact the Graduate College regarding any of these policies, please email thesis@illinois.edu. IDEALS and the University Library are actively digitizing dissertations and theses that were originally deposited in paper. Unless we have the agreement of the author or the thesis or dissertation was published as a technical report or working paper series by a university department, these dissertations and theses are restricted to those with an active netID and password issued by the University of Illinois at Urbana-Champaign. Dissertations and theses themselves may not be updated or changed. If you have authored a dissertation or thesis in the past at the University of Illinois and would like to see it appear here or would like to open access to a dissertation or thesis already made available here, please fill out the Request to Make Dissertation or Thesis Available in IDEALS form or contact ideals@library.illinois.edu for more information. In the first search box, type Education and select Subject Heading (all) - SU from the dropdown menu at the right. Type in the years 2000 to 2004 in the Start Year and End Year boxes. If you're unable to locate a pre-1985 U of I dissertation in the online catalog or in a database, search the physical thesis file that is in the card catalog on the second floor of the Main Library. The card catalog holds records for the archival copies of all theses and dissertations on deposit in the library from 1873 until the beginning of 1984. It is also useful when searching without a complete citation. Visit the Information Desk for assistance using the card catalog or for help finding dissertations in general. For more information, see this guide on how to use the card catalog.